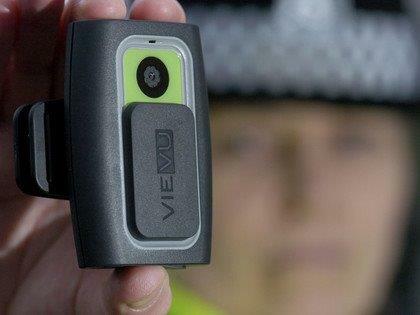 Example of a body camera worn by a police officer. Imagine you are on Main Street when you overhear this conversation: “That wreck on Highway 21 looked bad last night, and the Johnson boy looked to be really hurt.” The word “looked” caught your attention, so you ask the citizen how he knew about the crash. He tells you he watched it on a social media site that morning. Your investigation reveals that one of your first responders was wearing a video camera and posted the recordings to the internet. Departments must understand and inform their responders that “body cams” and “helmet cams” worn by any personnel while they are working are capturing government data regardless of who purchased the camera. As a consequence, the recordings must be maintained and released only in accordance with the Minnesota Data Practices Act and the records retention laws—or legal liability could result. Cities need to enact policies and procedures on how this new type of data is to be handled, and city personnel then need to be trained on the policy. In 2006, two California Highway Patrol officers e-mailed their photographs of a 17-year old fatal traffic victim to acquaintances. The photos hit the web and went viral. In what has been called the “tragedy that will not fade,” the family began receiving these photos on their computer at home with messages that read “I’m not dead yet.” The family had to disconnect all access to the internet. After years of litigation and appeals, the family recently reached a settlement for $2.37 million. The technology is already here, leaving cities to grapple with how to deal with it. The addition of the video camera in the squad car opened a new window to police work. 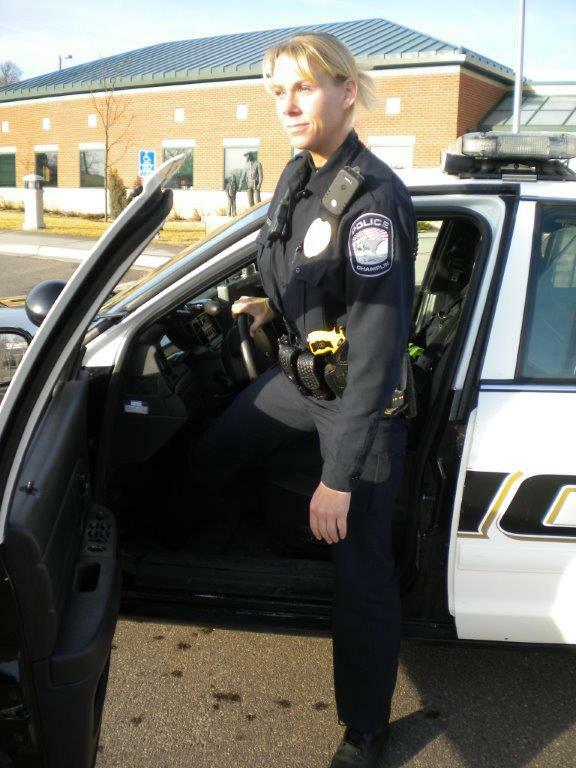 Recently, the Burnsville Police Department transitioned to a body camera system where a camera is worn by the officer. The video captures the domestic abuse suspect and victim as the officers arrives; it captures the bar fight, and the fleeing suspect. Importantly, a large component of the Burnsville camera system is the data storage, retention, and maintaining of the data as evidence. Burnsville PD vehicles are outfitted with cameras. Some want to document their actions but work for departments that cannot afford a city-owned system. Understandably, they want the protection that a camera and recording provide them, as every night they confront people who do not tell the truth the next day. Surprisingly, though, some of these videos are also showing up on social media sites. When a city employee or volunteer acts on their own to purchase and use a body cam, they need to be aware that it creates both legal and practical concerns over how the data is maintained and shared with the public (if at all). The League of Minnesota Cities Insurance Trust (LMCIT) recommends that cities proactively develop and enforce policies to prohibit the use or wearing of personal audio and video recording devices while working unless the devices and recordings are used and maintained in accordance with a thoughtfully developed department policy that complies with records retention and privacy laws. Being proactive will protect both the city and its employees and volunteers—who may simply not be aware of the legal requirements cities face related to data, or the big-picture ramifications of their actions. It always happens fast. The firefighter, medic, or police officer is concentrating on the call they are handling, and often carrying equipment like a medical bag, an axe, a flashlight, or a clipboard—and suddenly they slip and fall on ice. Once they are down, there is a momentary loss of awareness and usually a quick mental check of what just happened. That is often followed by a self-assessment and a check to see if they are injured. 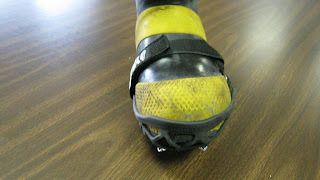 Aggressive treads and ice cleats are "like four-wheel drive"
Too often, they are injured. Eleven percent (11%) of the police work comp injuries are the results of slips and falls on ice. That number is even higher for firefighters due to the icy environment at winter fire calls. In addition to the lifting and carrying of heavy equipment, firefighters are usually walking with an air pack on their back. We also know that statistically an injury from a slip and fall on ice is more severe than a “normal’ slip and fall. As we head into winter, there are four proven tips to reduce ice- and snow-related slips and falls. #1. Awareness. Bring up the dangers of slips and falls at trainings, meetings, and roll calls. Remind each other at the scenes of emergencies to be careful, look for ice and packed snow, and identify the hazards. When snow is predicted or when we are in the freeze and thaw cycles, these reminders should be daily. #2. Footwear. 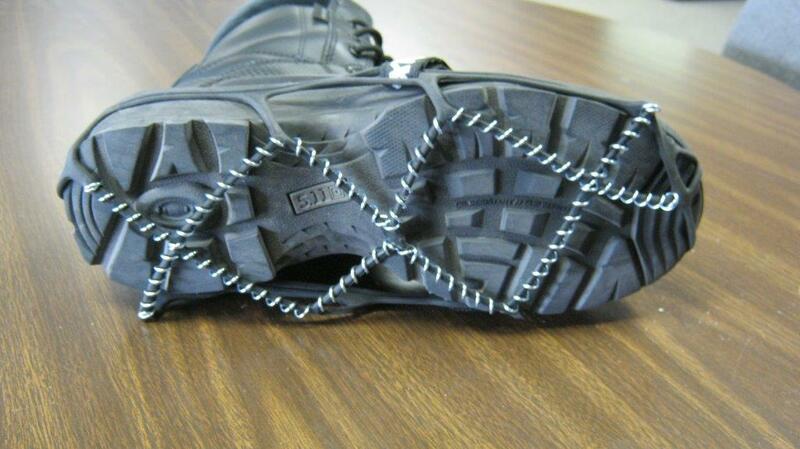 Be sure your boots have aggressive tread to minimize slips. Get ahead of the problem and have your new boots before the weather changes. #3. Ice cleats. They work, they go on and off fast, and they don’t impair your ability to drive. Last winter the city of Willmar gave every responder a set of Yaktrax-brand cleats. One of the police officers said, “It was like I had four-wheel drive!” They slip on over your fire boots or duty boots in just a few seconds. There are a couple of brands and models. My pair cost $21.50 online. #4. Three points of contact. This technique for getting in and out of a vehicle is a time-proven method to avoid slips and falls. The goal is to have at least three of a responder’s arms and legs in contact with a solid surface as they get in and out of a their car or truck. 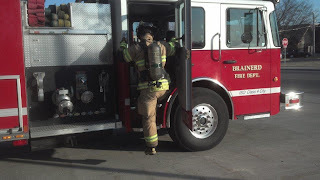 For fire apparatus, that means climbing down backwards and making use of the grab bars and steps. For police officers, it means coming out forwards but holding on to the door (or door frame) as they get their feet underneath them. It takes some practice, but it works. Our statistics show that a slip or fall on ice is a 25% higher claim than a “normal” fall. Police driver fatigue: we must manage the risk. Every police officer who has worked a night shift has dealt with the issue of fatigue and driving. Many officers have caught themselves nodding off while at the wheel, or suddenly realized they can’t remember the last few blocks they traveled. We know there are times when officers are experiencing very short sleep periods and are drowsy, and their ability to drive is severely compromised. On a straight flat road with no traffic, they might luck out and be startled awake by the tires hitting the shoulder. But often that is not the case. And this concern goes beyond law enforcement. We know our EMS transport services are dealing with this issue—especially for crews returning to their stations after transporting a patient to a hospital, at night, and when things are quiet. The same risk factors apply. Want to know more? We have a free webinar on this topic. I am the moderator, and League of Minnesota Cities Insurance Trust (LMCIT) Loss Control Consultant Matt Columbus presents on police officer driving fatigue. The webinar was presented live on Thursday, November 15, and the recording is now available on the LMC website. Fatigue can cause loss of situational awareness. We also discuss recent research on the topic, including studies from Harvard Medical School and the ongoing research of Dr. Bryan Vila (former Los Angeles-area police officer and associate professor of criminal justice professor at the University of Wyoming, and author of the book Tired Cops). Most importantly, Matt explores recognition factors, a culture of denial, and prevention techniques that officers, supervisors, and departments can employ to diminish driver fatigue. Randy Means speaks to a full house. Randy Means brought up one of my favorite sayings during the recently completed League of Minnesota Cities Insurance Trust Police Workshops. For those who don’t know Mr. Means, he is one of the national speakers and consultants in the areas of police leadership, supervision, and risk management. Mr. Means presented to capacity audiences of police administrators recently at workshops in Bloomington and White Bear Lake. Means was addressing the need to keep police operational policy current—and he got more than a few smiles and head nods when he asked how many departments have policies that are never followed, policies that are followed most of the time, and polices that are always followed. Means peppered his comments with relevant, true stories that brought his themes to life and demonstrated the relationships of policy, training, supervision, and discipline. I found myself nodding in agreement when he brought up the phrase, “If it ain’t broke, don’t fix it.” About the time my chin went down, Means came right back with: “That’s the perfect time to fix it! Why wait until you are dealing with a problem?” He was referring to proactive risk management and staying ahead of difficulties. Ah-ha, I got the point. We hope we can bring Randy Means back for additional workshops. The course evaluations and the personal comments we received after the presentations reflected that his message truly resonated with those of you who attended, and you want more. The Problem Since the Lakeville Police Department moved into their new police station in 2008, they had experienced a number of car accidents in their underground garage. 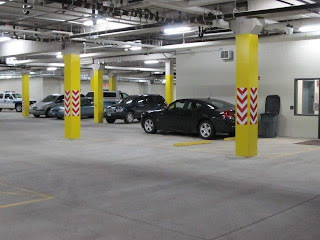 Most of the accidents were the result of squad cars colliding with concrete pillars as they backed in or out of their assigned parking spaces or turned “too short” and struck a pillar. Lakeville reached out to their League of Minnesota Cities Insurance Trust (LMCIT) field consultant, Matt Columbus, for assistance. The Visit Matt met with the Lakeville fleet supervisor, Sergeant John Kornmann, and his staff as they mapped out what was happening, identified trends, common causation factors, and walked through the garage. There were multiple factors in play, including the parking of cars still in service, the cars that were out of service, a variety of vehicles with different turning radiuses, blind spots, and those pillars. 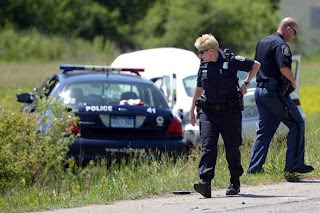 During the field visit, the officers mentioned an unrelated outside driveway where they had experienced a couple of “near misses” due to officers stepping out from behind a blind corner and onto the driveway, unaware that a squad car was approaching. Brainstorming In what could best described as brainstorming, ideas were put forward and validated against the real-world needs of running a police department. Good ideas were walked through, diagrams were drawn, and some workable solutions began to emerge. All agreed that test periods were a good idea before more permanent solutions were implemented. They initially began by marking the driveway with chalk and using temporary signs. 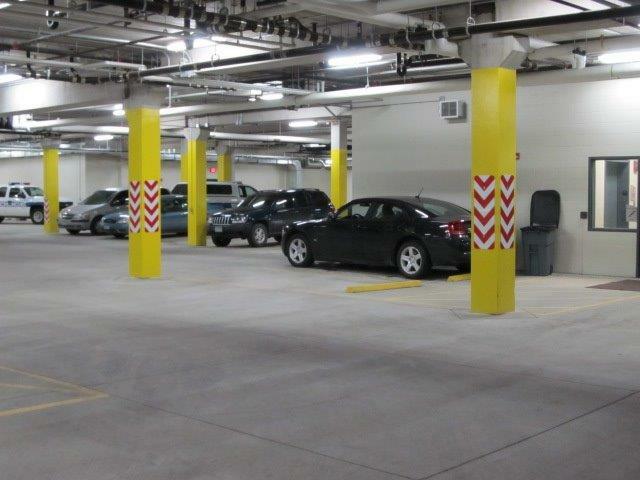 The Results In the words of Lakeville Police Chief Tom VanHoff: “What a success!” The final plan included the implementation of one-way traffic in the garage, a designated parking plan for the in-service squads, increasing visibility, and protecting the pillars. They also figured out the pedestrian problem outside and have received many positive comments from officers about the improvement in safety. It was teamwork, collaboration, and the expertise of both the officers and Matt that made this work. Police departments may not be as familiar with LMCIT’s field consultants as public works. You should know that all LMCIT member cities are assigned a consultant who can help with projects like this, and other workplace health and safety concerns. Contact Cheryl Brennan at (651) 215-4079 if you would like the contact information for your field representative. And the accidents? Only one minor accident has occurred since the changes were made, and the problem was swiftly identified and corrected. 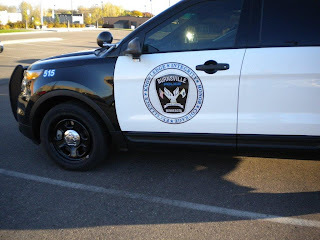 The Lakeville Police Department has achieved a significant reduction in the number of accidents and is operating more safely as a result of this team effort. 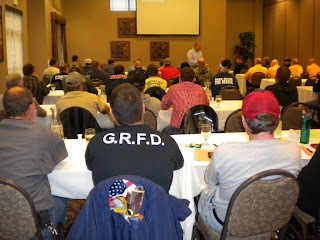 When Dr. Rich Gasaway finished his Fireground Safety Workshop in Grand Rapids last Thursday night, the room of firefighters stood up and gave him a standing ovation. It was a remarkable evening. -As a firefighter, fire officer, and fire instructor—this class is a must. -I recommend this program to every fire department! -It should be mandatory for all fire officers. -This presentation was eye opening! -I strongly encourage anyone on a fire department to attend this class. -Thank you, thank you, thank you! -Many principles apply to all disciplines of life. -Dr. Gasaway is articulate, experienced, sincere, and passionate. The Police Leadership Workshops with Randy Means are also filling fast! The Bloomington workshop has already filled up, but there is still room for a few more at White Bear Lake on Oct. 3. The crew suited up and got into their air packs during the response. No one was wearing a seat belt. When they came to the intersection of Co. Rd. 27 and 72, they planned to turn left at the T intersection. The driver applied the air brakes, but nothing happened as the pedal went to the floor. The driver managed a downshift, but it was too little too late to stop the set of events that was in motion. The truck swerved to the right—tires screeching as they left scuffmarks on the pavement—the truck left the road, went into the ditch, and rolled over. The truck was totaled...note the booster tank. The State Patrol report indicates that the brakes failed and the truck rolled over one time. A witness to the crash said the truck rolled two times. Either way, as the truck rolled, the 1,000-gallon booster tore loose from the truck and broke apart. Equipment and dirt went flying everywhere as the truck came to rest on its wheels, pointed back in the direction it came from. 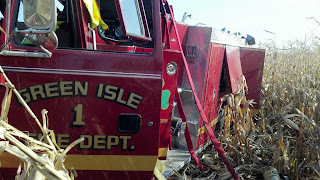 The pre-connected hoses in the cross lays had flown out and were wrapped around the truck like a ribbon on package. One of the witnesses to the accident was a firefighter from another department who was also responding the call. 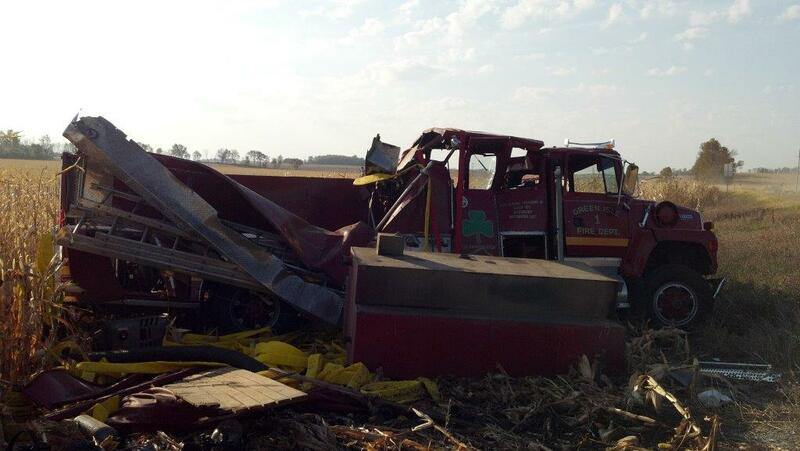 He notified the Sibley County dispatcher who immediately started emergency responders to the crash site. As the scene began to stabilize, responders were dealing with the emotions of handling a serious emergency involving their friends and fellow firefighters. (We handle other people’s emergencies with great proficiency, but we often do not handle our emergencies as easily.) Neighboring departments came to assist, and after tending to the injured they spent time walking the fields at the crash site and picking up the equipment that had been thrown as the truck flipped. Equipment was thrown from the truck. 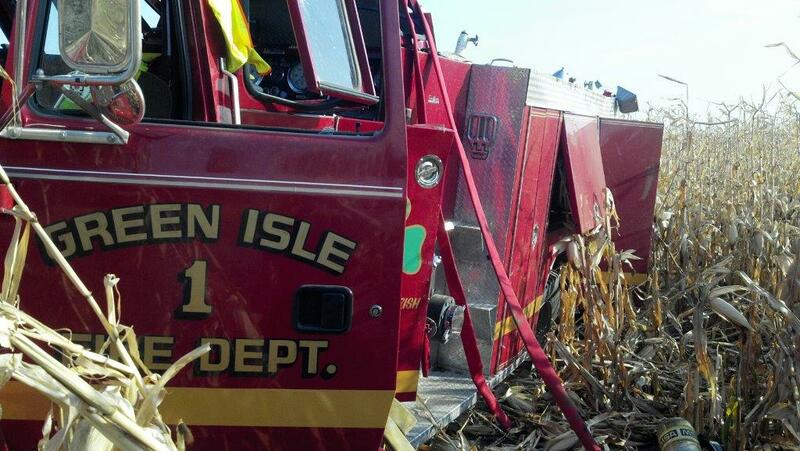 Fire Chief Vos is determined to pass on the lessons learned from the Green Isle crash. Seat Belts - Seat belt usage needs to be mandatory, it needs to be in your policy, and it needs to be enforced—it’s the law. No exceptions. 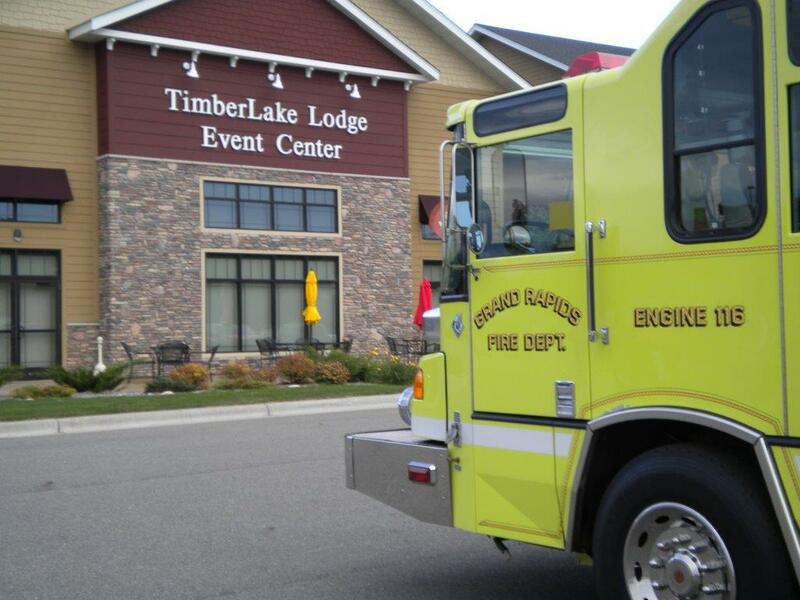 Truck Maintenance - In Minnesota, fire apparatus are exempt from the annual DOT inspection. However, if the truck is involved in an accident, a DOT inspection will occur and the results will be part of the accident investigation—and potential criminal investigation. 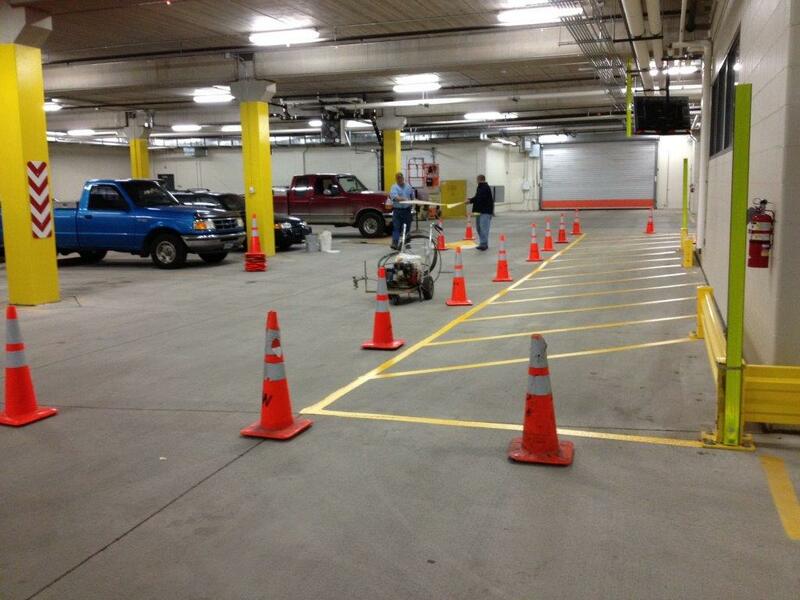 The truck and your department will be held to the DOT standards. Good truck maintenance and detailed records are critical. In the eyes of the court, if it was not documented, it never happened. 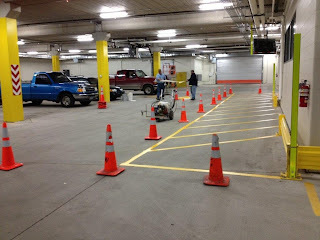 An annual DOT inspection and detailed maintenance records are good risk management. Talk About What Happened - The use of the regional Critical Incident Stress Debriefing (CISD) team “helped everybody” as the “raw emotions” of caring for other responders and friends was talked through and the incident was reviewed. Chief Vos said a separate meeting with only the firefighters involved was critical to getting the department functioning again and restoring relationships. Risk vs. Benefit - The responders are of no use if they don’t get to the scene. The reported house explosion turned out to be a stove fire. Fall Training Workshops Are Back! The League of Minnesota Cities Insurance Trust (LMCIT) is sponsoring fire and police workshops this fall. The schedules have been set, and two top, nationally recognized presenters are booked. For just $15, you can't afford to miss these opportunities! 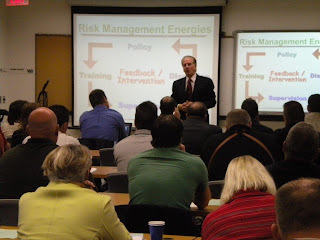 We are very fortunate to have Randy Means scheduled for the fall police workshops. Mr. Means specializes in police operations and administration. He is a long-time legal and risk management instructor for the International Association of Chiefs of Police and has instructed for virtually every major institutional provider of law enforcement—training more than a quarter-million police officials covering every state and Canada. Mr. Means writes the legal column for Law & Order Magazine. Mr. Means’ presentation of Police Leadership in the New Normal will feature his no-nonsense approach to leadership and management that has gained national attention—and will resonate with department leadership and line officers alike. Attending this workshop will improve your skills for working in a world where resources, expectations, values, and communications are changing—and for working in new cooperative relationships, joint powers agreements, and multi-agency departments and task forces. 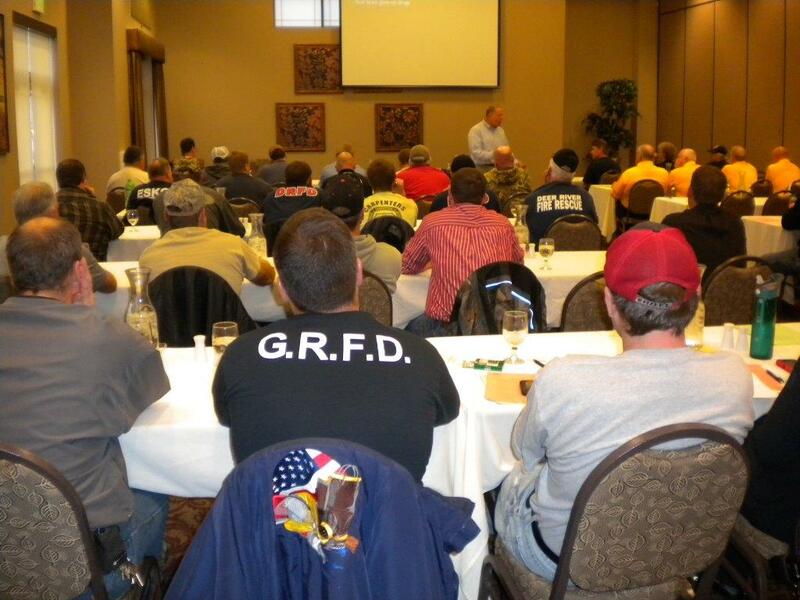 We listened to the firefighters who attended Dr. Rich Gasaway’s last series of workshops—and the comments, participation, and positive evaluations were unlike any we have ever received! This fall, Dr. Gasaway will be back presenting Training for Failure: Why First Responder Training Must Change, which will cover why some methods of training firefighters on essential skills may actually contribute to near misses and casualties. The workshops will be in the evening and will include a meal. Dates and locations are: Brooklyn Park, Sept. 12; Grand Rapids, Sept. 20; Rochester, Oct. 1; Mankato, Oct. 2; Brainerd, Oct. 15; and Perham, Oct. 16. The courses are filling fast, so register early! On a recent Friday night, my wife and I attended a funeral for an 18-year-old man who had taken his own life. The first family member to see me as we walked into the funeral home immediately said, “I’ll tell you, we have a wonderful sheriff’s office.” I was caught off-guard and was not sure where the conversation was going. continue the tradition of excellence. She went on to say how caring, careful, and understanding the responding deputies were with the family. The deputies kept the family informed as they investigated and also provided resources to them. She starting crying and said, “They even cleaned up the mess, they were wonderful.” Similar comments were repeated by the other family members we met in the receiving line. Those deputies were “Level III” professionals. We have a fire department that has started a program when they respond to “lift assist” calls to help one of their residents back into bed or a chair after they have fallen. In addition to addressing the immediate issues, they have a team of firefighters follow up with the residents to see if they can address the problem and not just the symptom. That is “Level III” performance. It is the letter to the editor in the local newspaper from the carpet store owner who lost it all in the fire and continually thanks the fire department—not only for their fine work but because they genuinely cared about his business, his employees, and their families. And it is the police officers who didn’t give up on a prolonged investigation and maintained contact with the victims so they did not feel abandoned or in the dark—and got the conviction. It is the “Level III” performer who remembers that they are dealing with people in one of the worse moments in their lives. 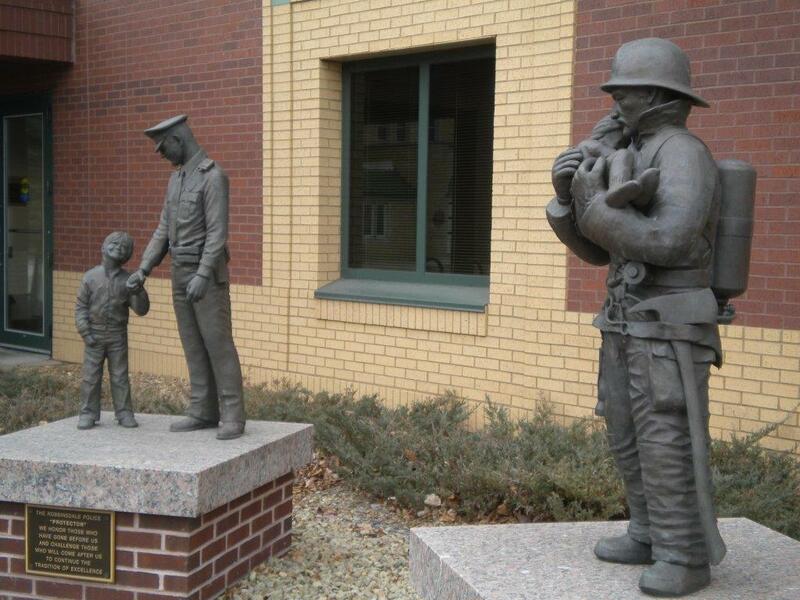 Statues outside the Columbia Heights public safety building. In his book, Going Pro, Tony Kern writes of the importance of continuous improvement, ethics, and setting the bar high for a new level of professionalism. 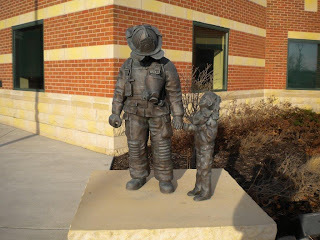 Many of Kern’s themes have been echoed by our national public safety figures: Alan Brunacini, Gordon Graham, Billy Goldfeder, and Randy Means have been long been champions of this level of personal and departmental professionalism. It is truly doing the right thing and doing it the right way. By practicing precision and seeking perfection, we are also improving our readiness for the day when the world turns mean and we need to be near perfect just to survive. The book was given to me by a friend. I highly recommend the book and have purchased two additional copies that I have given away as gifts. Some of the sims (similarities) were: personal commitment, highly specialized training, lifestyle impacts, high levels of exertion, highly specialized equipment, a rotation of “players” in and out of the “game,” and high levels of risk. What struck me more were the differences. 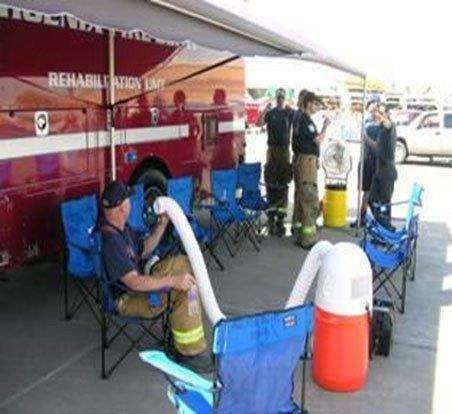 For responders, there is no time to stretch or warm up, no time to hydrate ahead of the event, and no idea when the “competition” will occur. It is like training for a marathon, and you have no idea when the race will start or even what day it will happen. Scott explained the “inter-relational changes” that start occurring during exertion in hot weather: the body strives to maintain body function and regulates fluid volume while it tries to preserve a normal blood pressure. The blood thickens, and that further stresses the heart. “Look for who is not sweating,” he advised. Rehab can keep you in the game. He also shared some “hot statistics:” At 37 degrees, a healthy, physically fit person can do 95 minutes of hard work. At 104 degrees, that drops to 33 minutes—and there is a sharp decline in performance after 10 minutes. A 1-2% drop in hydration will decrease work performance 35-48%. The impact of heat is cumulative, and “you do not rebound.” You have got to get ahead of the problem. 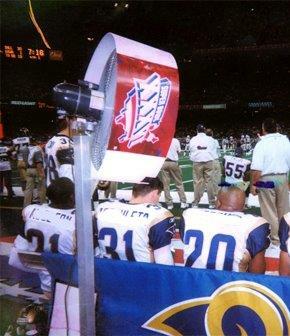 He ended with photos of professional athletes drinking sports drinks, while large fans and water misters blew across them. In the background were the team trainers who were monitoring the athletes. It looked a lot like rehab at a fire scene. Allina EMS South Operations Manager Jeff Lanenberg presented the second part of the presentation, which focused on the Metro Fire Chief’s rehab program and the use of EMS at large events and calls. It made sense, and the comparison to professional athletes was effective. Make rehab and planning for heat part of your operating procedures. Take advantage of the events that are scheduled—the special events and community festivals—and plan for the summer heat. Make hydration a briefing item during training or roll calls briefings. When it is hot, we need to watch each other and help each other. Preparation and rehab lets you stay in the game. This story is a bit like a snowball that was set in motion by a series of events and the right people coming together at the right time. Eden Prairie Fire Department air pack being scanned into the tracking system. Event #2. 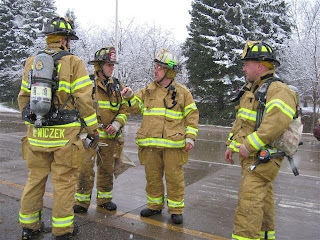 Those discussions progressed to thoughts that a common brand of air pack would seem to make sense, as these departments use “mutual aid’ with each other frequently. Each department had a different brand of air pack and some were very loyal to their brand. Event #3. 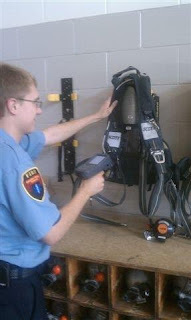 In the words of Eden Prairie’s Assistant Fire Chief Steve Koering: “We needed to get out of the air pack business.” The demands for certification and training of department technicians—coupled with the ongoing demand for tracking and accountability—sent a clear message that they needed to focus on their core competencies. This responsibility, along with the shared risk, could be transferred to a manufacturer who understood the issues and would create a best practices solution. Event #4. “We saw this as an opportunity to capitalize on the reduced risk while promoting shared services,” Minnetonka’s Fire Chief Joe Wallin added. Several departments—including Eden Prairie, Minnetonka, St. Louis Park and Hopkins—worked with the Minnetonka and Eden Prairie City Attorneys to create a Joint Powers Agreement (JPA) for the purpose of buying a common air pack and wrapping the air pack maintenance into the agreement with the manufacturer. The JPA group worked hard in uncharted waters over a 4-year period to achieve the results realized today. The firefighters quickly overcame their apprehension of switching brands of air packs and saw the benefits of collaborative technology. Now bar coding and scanning—tied to a web-based application that tracks the history of every unit in service from the time the pack is delivered until it ultimately is replaced or upgraded—is the method for managing this important information. Minnetonka firefighters with turnout gear and air packs purchased through the JPA. Event #5. The group has continued to expand in scope and membership. It now has 20 members, with six more in the process of joining. One of the new members is in far western Minnesota. The power of the JPA can now be used for any public safety equipment. Current agreements exist for SCBA (self-contained breathing apparatus), turnout gear, hose testing, and station uniforms. Thoughts of adding ladder testing and annual physicals are on the horizon. Members can access the services they need within the JPA contracts and can actively participate as members of its Operating Committee. The SW Metro JPA is about: responsible government, employee safety, accountability, and interoperability. It is not about the money. So what about the money then? Ultimately, working together like this saves money in both the long and the short run as well—and there is no cost to join. Up next time…"HOT HOT HOT—Summer’s Here!" 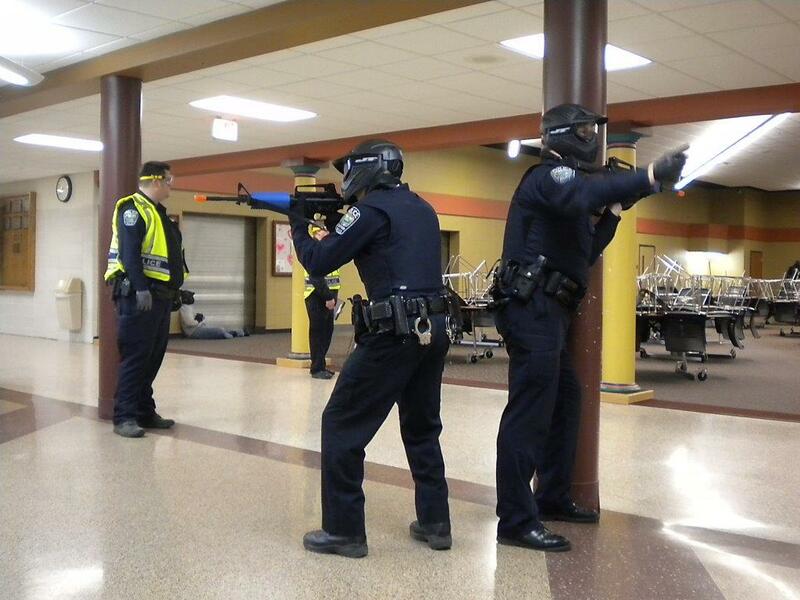 A TSO observing Cannon Falls active shooter response training.